LONDON, England (CNN) -- More than 100 British lawmakers have signed a motion criticizing the BBC and Sky News for refusing to show an emergency appeal for Gaza. 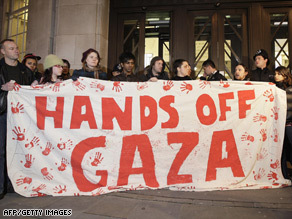 Protesters hold a banner outside the entrance of BBC Broadcasting House in central London. British terrestrial broadcasters ITV, Channel 4 and Channel 5 televised the appeal, made by the Disasters Emergency Committee (DEC) on Monday night. The BBC and Sky News defended their position by saying that airing the appeal would compromise their reputation for fairness and impartiality. However, Richard Burden, the Labour MP who tabled the early day motion, said 112 MPs had signed it by Monday evening, The British Press Association reported. The motion rejects the "unconvincing and incoherent" justifications given by the BBC and Sky. In quotes carried by PA, Burden said: "The fact that well over 100 MPs from different parties have signed this Commons motion shows the breadth of concern about the position which the BBC and Sky are taking. "The arguments that BBC managers have been putting forward in defense of their refusal to screen this appeal have shown themselves to be even more unconvincing and contradictory as time has gone on. "Viewers and listeners can see the difference between a humanitarian appeal and politics -- even if the BBC and Sky management cannot." That view was echoed by thousands of protesters at the weekend who demonstrated at BBC buildings across the UK. On Saturday, about 5,000 people demonstrated in front of the BBC's Broadcasting House in central London, while 50 people protested at its Scottish headquarters in Glasgow the following day. On Monday night, PA reported that about 15 students -- members of the School of Oriental and African Studies' branch of Stop the War Coalition -- occupied the reception area of a BBC building in central London and demanded to speak to a senior member of the corporation. Protesters outside the building waved a banner reading "Hands off Gaza" and decorated with blood-red handprints. They chanted: "BBC -- shame on you," PA said. The Disasters Emergency Committee (DEC) includes the British Red Cross, Oxfam, Save the Children and 10 other charities. A spokesman for the umbrella group told CNN at the weekend that the DEC is "disappointed that the BBC declined to support the Gaza appeal. It might limit the reach of our key message to the general public." The spokesman, who asked not to be named, said the BBC had to make its own decision about impartiality. "That is a decision they must make. We have no view on that subject," he said. CNN has not been asked to screen the appeal.